Four out of five jobs in the U.S are in the service industry, making it the fastest growing part of our economy. Western Mass Jobs with Justice is working on two exciting campaigns empowering workers to fight for dignity, respect, and better working conditions in the service sector. We are working to find ways to raise standards in this traditionally low wage and non-benefited sector of our economy. 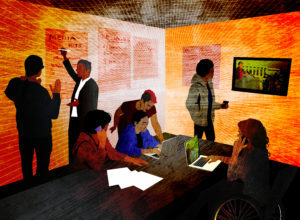 Our second project is building the Western Massachusetts Worker Center. The center seeks to build power for working, low-wage, and immigrant members in the Western Massachusetts community. Through innovative and creative worker-driven organizing strategies, the Center will seek to unite likely allies in order to build power for workers in the Pioneer Valley. The center will strive to build coalitions and partnerships with unions, community groups, cooperatives, and individuals and draw attention to the common struggles of people across Western Massachusetts. By building these coalitions the Center will expand our political power in the Pioneer Valley and strengthen the voice of vulnerable workers in the political process. The first organizing project of the Worker Center is expanding upon the traditional work around our food system. The Pioneer Valley prides itself in being a hub of the local food movement, which values sustainability, buying local, and fair trade. This organizing project seeks to expand our local communities’ shared understanding of a sustainable food system to include improved wages and working conditions for all workers in the food chain. Drawing on the principles laid out by the Food Chain Workers Alliance, the Western Mass. Worker Center’s restaurant workers organizing initiative seeks to build a more sustainable food system that respects workers’ rights, based on the principles of social, environmental, and racial justice, in which everyone has access to healthy and affordable food. We will strive for a community where workers benefit from the fruits of their labor and build toward an economy where no one is working poor. This project will open the door to further organizing in the food chain that includes workers who plant, harvest, process, pack, transport, prepare, and sell food. For further information or to get involved with either of these projects you can visit www.wmjwj.org or email rosebookbinder@wmjwj.org. Jobs with Justice has created a national coalition and a network of local coalitions that connect labor, community, student, and faith-based organizations and activists on workplace and community social justice campaigns. You can find WMJwJ on Twitter and Facebook. This entry was posted in Uncategorized and tagged WhatIsTheNewEconomy. Bookmark the permalink.